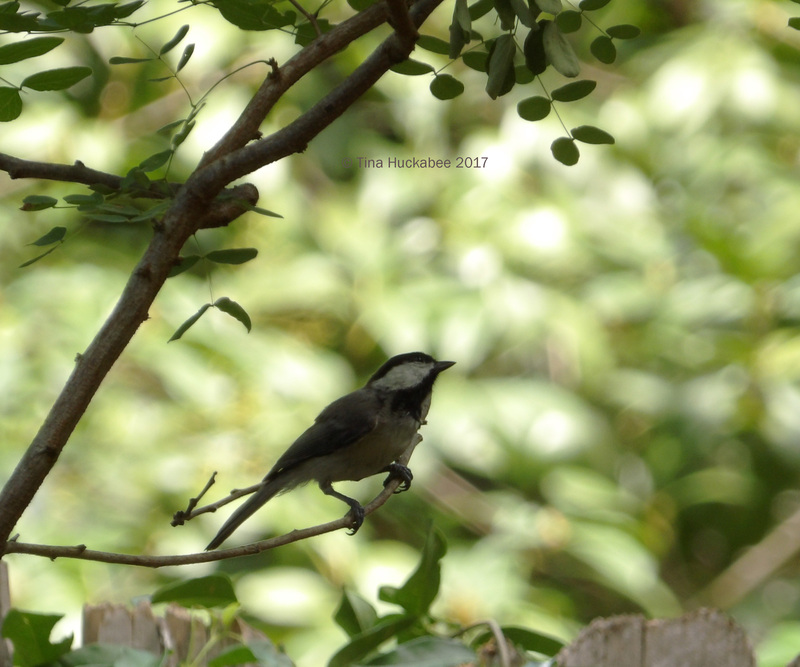 Despite summer’s heat as daily fixture of life, the garden and its critters go about their business of growing and blooming, nectaring and seed-eating. I swelter in the garden, but revel in observing the abundance of wild activity. Welcome to Wildlife Wednesday, marked on the first Wednesday of each month and celebrating the wild things in our gardens and wherever we meet them. The garden currently enjoys no shortage of Horsefly-like Carpenter bees, Xylocopa tabaniformis. 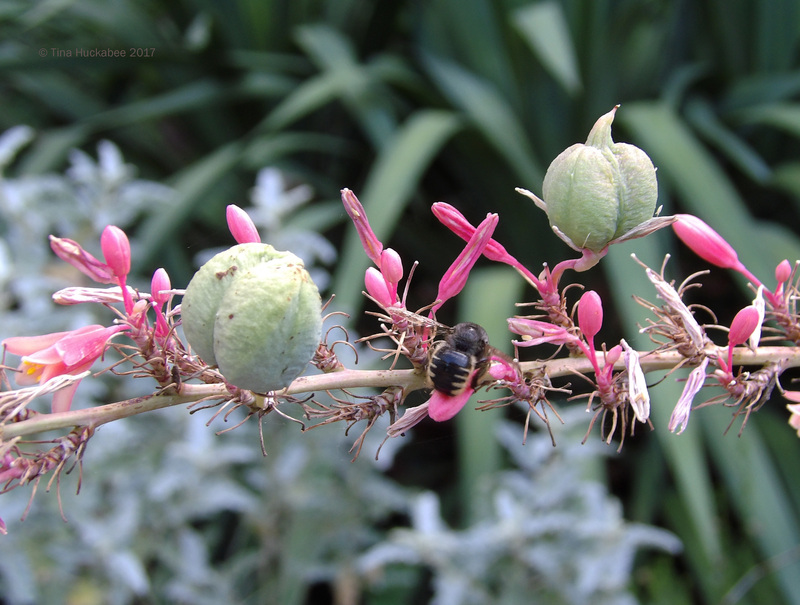 They are the most numerous, and active, of the native bees that I see; they are earliest at work in the morning and the last to clock-out in the evening. This one demonstrates nectar-stealing, so no pollination here, but she’s slurping up the good stuff for her larvae and herself. 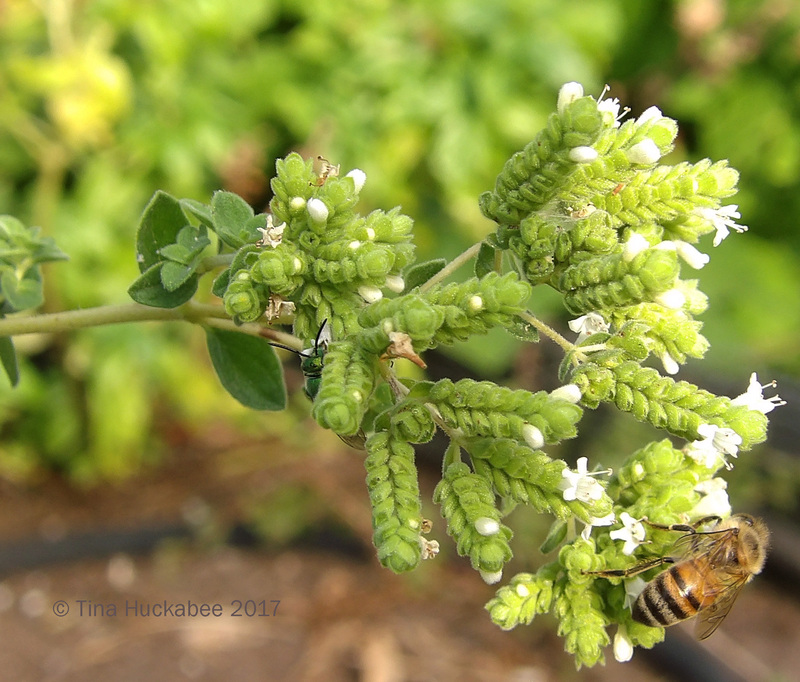 While taking my elderly dog for his outdoor breaks, I’ve noticed the popularity for blooming oregano among pollinators. The petite, clustered blooms attract a variety of pollinators–huge and tiny, colorful and plain. I was especially pleased to witness visits from both a male and female Eastern Carpenter Bee, Xylocopa virginica, a relative of X. tabaniformis. The white face indicates a male bee. Considered common here in Central Texas, I haven’t seen this species often and am happy to welcome this new-to-my-garden visitor. His lovely back side, wings aloft. The sun was spot-on as I photographed mid-afternoon–normally a problematic time of day for photos–but I think the bright light beautifully illuminates his subtle coloring. He and his female friend also visited Turk’s cap and Shrubby Blue sage blooms as well, but both favored the oregano flowers. 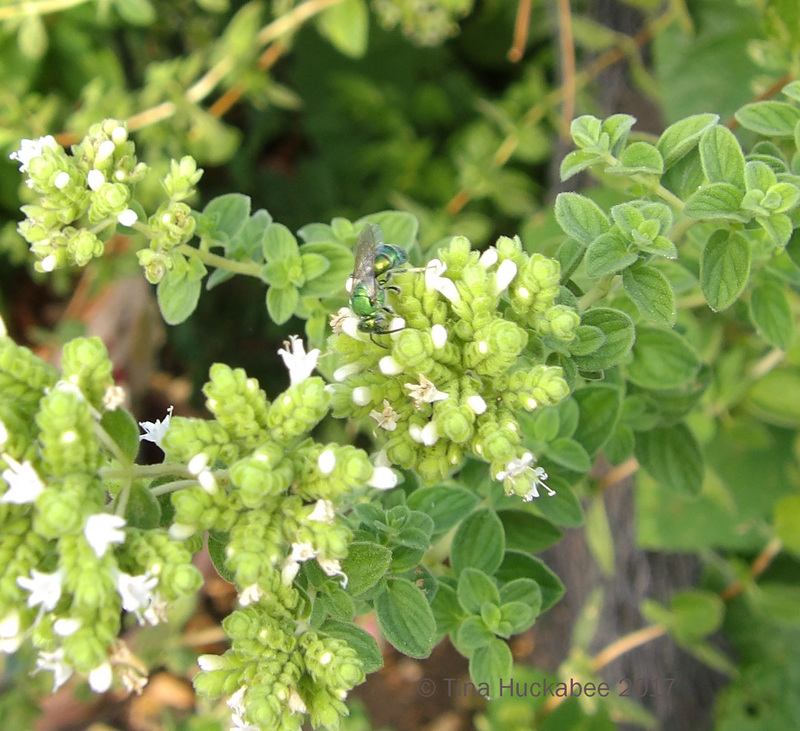 I grow two oregano plants (and also, two basil plants) in my herb garden: one of each for me to snip from and not allowed to flower, the others left to bloom for the bees and butterflies. 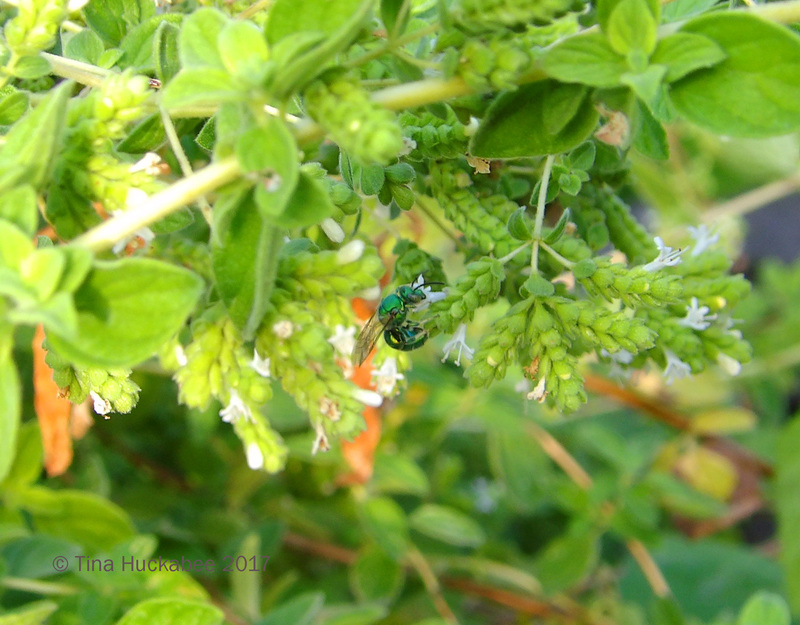 Another spectacular pollinator who works the oregano blooms is this stunning green metallic bee, which I believe is a Sweat bee, Augochloropsis metallica. I saw this bee (these bees?) several different times, and like the Eastern Carpenter, she nectars at several plants. But her favorite meal is found at the little oregano flowers. The Texas July sunshine highlights her stunning coloring and glittery presence. A two-fer in this shot with the sweat bee sharing space and food with a honeybee. 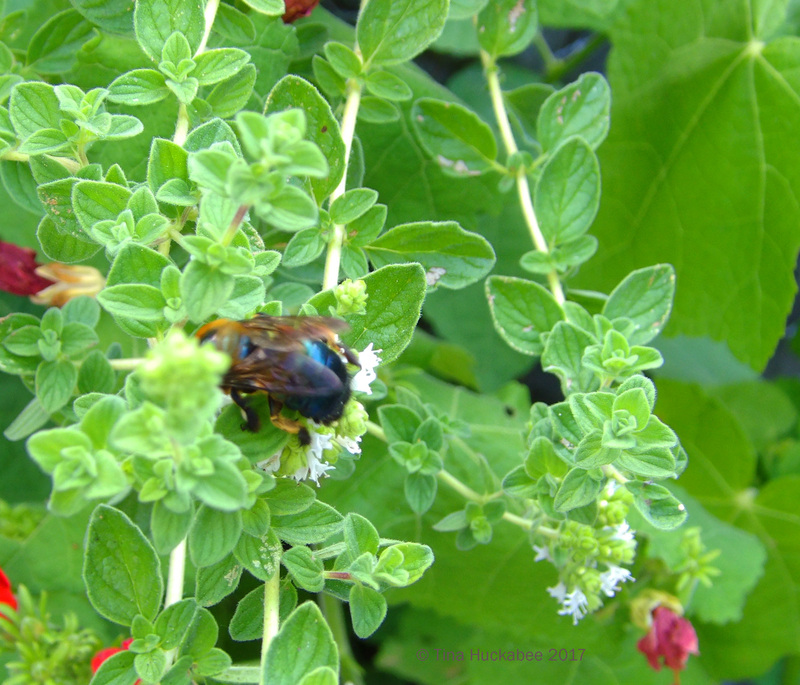 The honeybees are regular customers of the oregano flower buffet and are always buzzing around the oregano. Ms. Metallica plays peek-a-boo, while Ms. Honeybee gets to it! 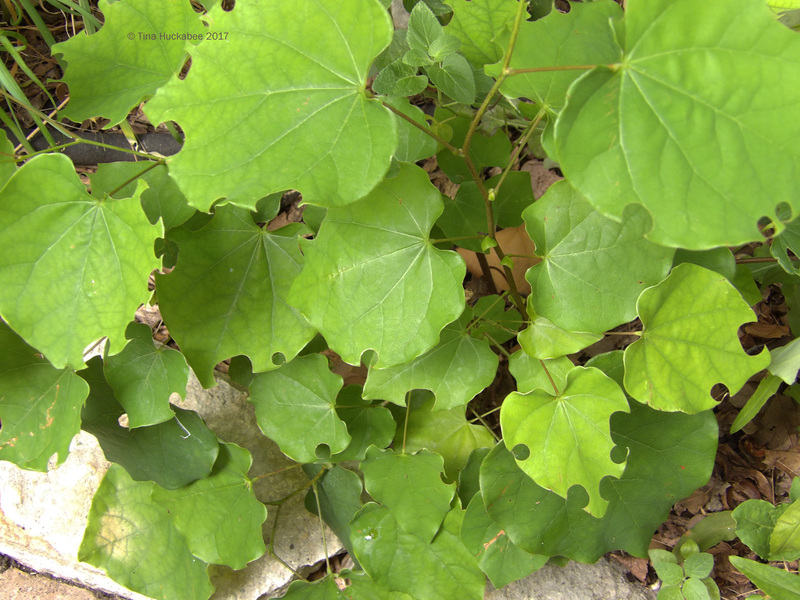 These scalloped leaves show cutter bee activity, though I haven’t actually seen them munching away. The females carve round holes, or partial holes, in leaves, then mix the leaf component with pollen and mud. The bees use the mixture in their nurseries as a stuffing to protect eggs and feed larvae. 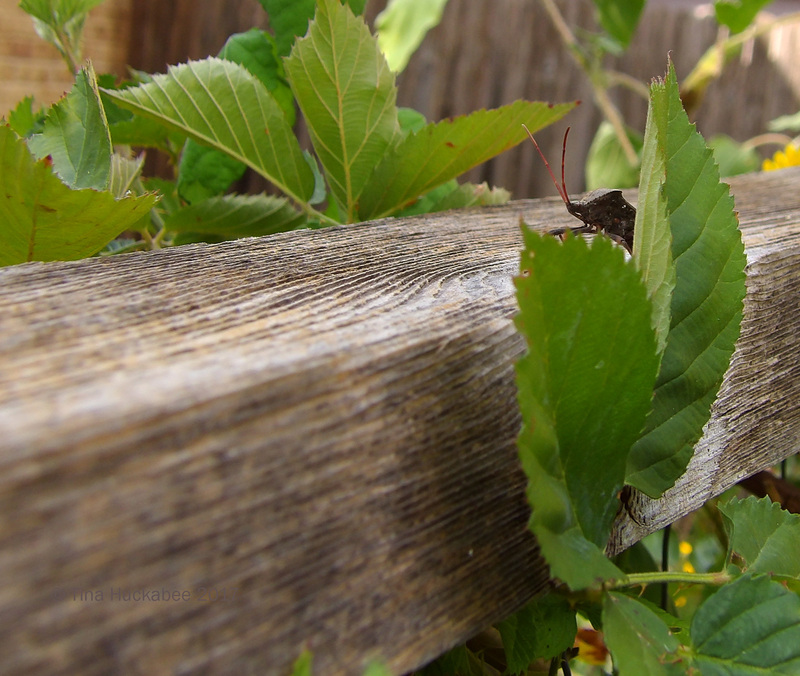 I spied this Leaf-footed bug, Acanthocephala terminalis, along the beam of a blackberry vine-enveloped trellis. I thought he might strike a manly pose for me; instead, he skittered behind a leaf, glancing once to check if I was still there. Later, he flopped down onto a sunflower leaf, which looks worse for wear, either from the doings of a sucking insect (maybe our leaf-footed friend? ), or perhaps, just the heat. I like to watch these insects. They’re shy and avoid confrontation, but can apparently deliver a wallop of a sting if need-be. I maintain a respectful distance and hope they don’t damage too many leaves. Dragons and damsels are back and it’s murder and mayhem in the garden, carried out with swift efficiency by these predatory beauties. 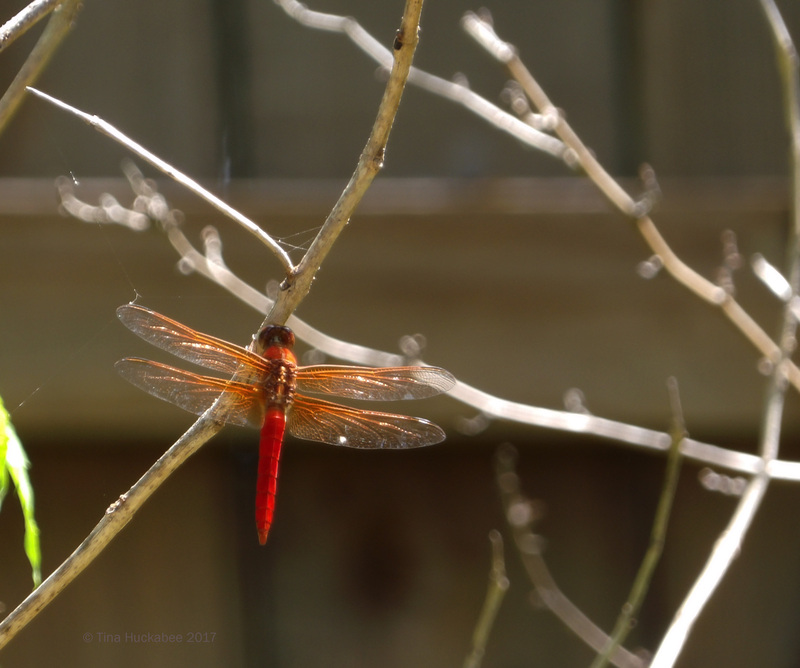 This sparkly jewel of a Neon Skimmer, Libellula croceipennis, is a fixture in the garden when resting and an aerial acrobat as he hunts mosquitoes. And I’m just fine with that. His bright coloring indicates a male. His mate wears a muted orange, not quite as dazzling. 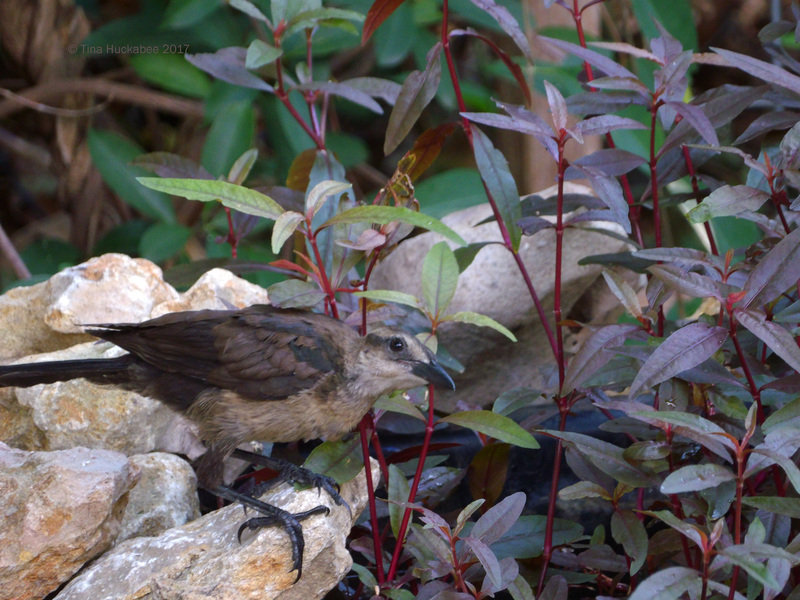 Resident birds while away the summer months, munching seeds and insects, and cooling off in bird baths and at the pond. This female (or juvenile?) Great-tailed Grackle, Quiscalus mexicanus, contemplates a dip in the waterfall. Grackles and Blue Jays are consummate bird bathers. Before they plop into the water to bathe or sip from its flow, many birds perch on the rocks and take advantage of the cover provided by the Ruby Red-runner plant which accompanies the flowing water into the pond. This Carolina Chickadee, Poecile carolinensis, steadfastly refused to look my way as it perched just above the waterfall. After winter, I didn’t prune the Yellow Bells, Tacoma stans entirely so that the birds could enjoy a safe place in which to perch and watch their surroundings. Still, he could have given me a thrill and glanced my way. I was able to catch a slightly better look at his cute face only after he flew to a different location. 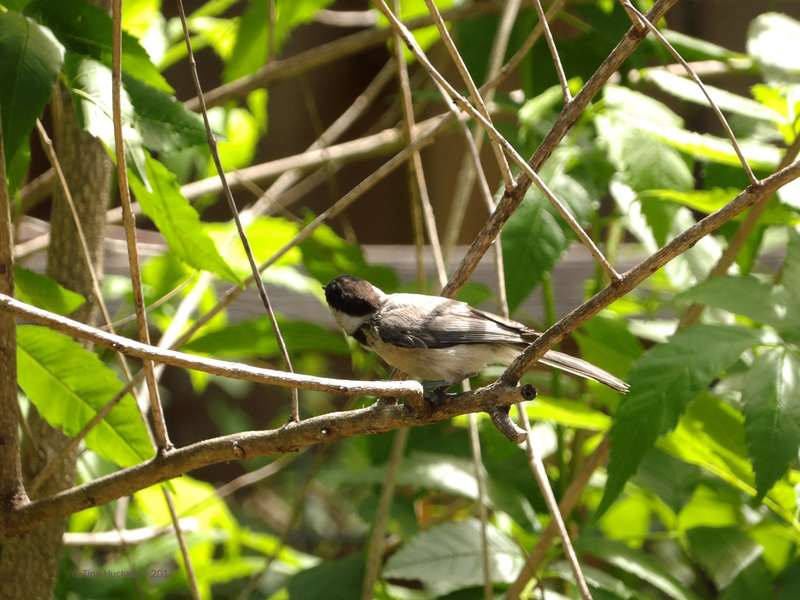 The Chickadees are year-round residents in Central Texas and regular visitors in my garden. We placed nest boxes for them, the Carolina Wrens, and the Black-crested Titmice, but had no takers–the nest boxes sit abject and empty. All summer I’ve watched as each of these parents showed their offspring the avian ropes: sipping from the baths and pond, noshing from the feeder and plants, and teaching the how-tos of safely traversing the trees. They’re content to visit my garden, but not move in. I have no idea where they nest, I just know it’s not in my garden. 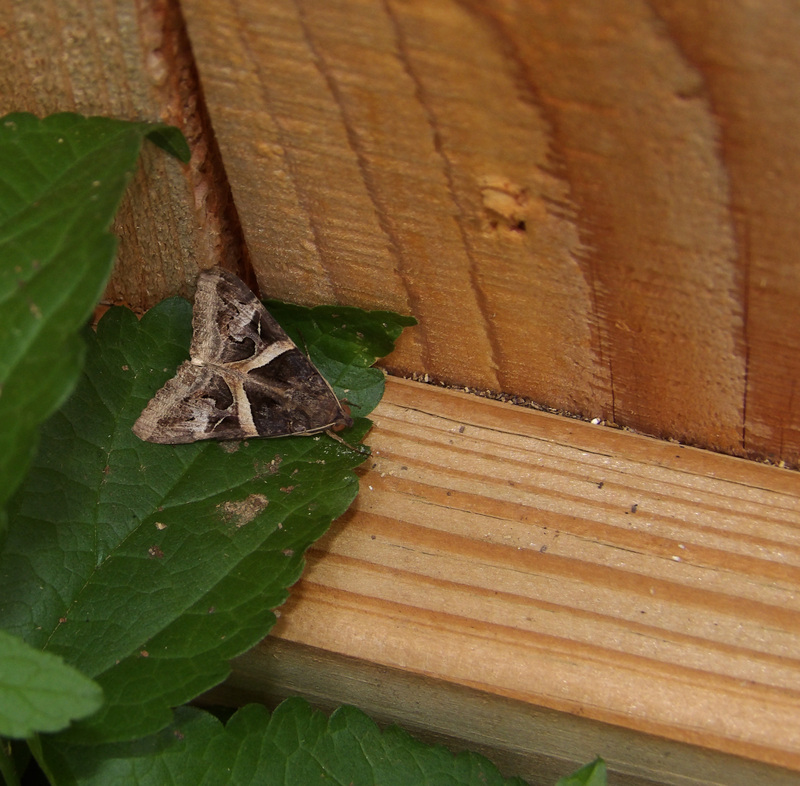 While pruning early one morning, I spied this resting moth, a Melipotis perpendicularis. I know that I’ve seen this kind of moth before, though Austin Bug Collection says that this moth is not common. Perhaps I grow its host plant, though I didn’t find information about that. Whatever you grow and whomever visits or resides in your garden, please post your wildlife happenings for this past month. If you don’t have wildlife in your garden, it’s easy to plant for them and provide a welcoming home: they’re entertaining, beautiful, and necessary for a well-rounded garden. When you comment on my post, please remember to leave a link to your Wildlife Wednesday post so readers can enjoy a variety of garden wildlife observations. This entry was posted in Uncategorized and tagged Urban Wildlife, Wildlife Gardening. Pollinator Gardening by Tina. Bookmark the permalink. Fantastic shots, especially the eastern carpenter bee. Thanks–he was busy with his work and paid no attention to me! Glad he was busy and stuck around. I love your wildlife postings! Perhaps one day I will start posting mine, though I am not the photographer you are! Awe, thanks Laura. I’d love for you to join in! I still have lots to learn on the photography front, but am tickled when the critters are willing to cooperate. Thanks! That leaf-foot guy is something–I always feel like they have personality and that they don’t mind getting one over on me. 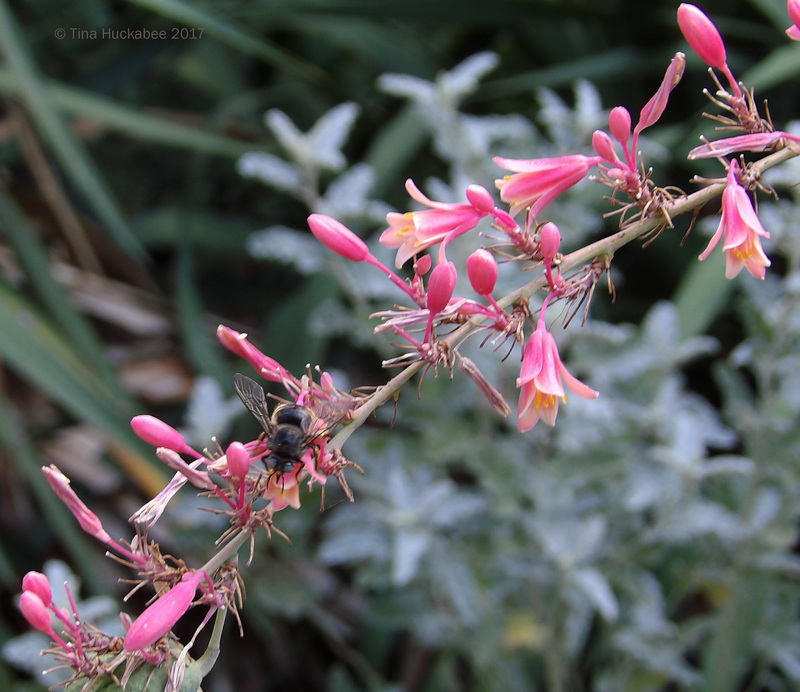 I always love to see the native bees, too. I liked that photo, too, Frances. I was aiming for the two of them to be side-by-side (which they had been), but I’m happy with what I got. I’m also content to have the birds visit, rather than nest here. But, one can always hope…. I enjoy your bee ID lessons though we haven’t had many bees this year. I like the idea of adding more oregano for blooms to share. My wildlife visitors are rather large this time. So sorry that you’re on the bee-less side–that’s a drag. Do you have any idea why? Native plants are great, but man do the pollinators love flowering herbs. I finally identified a strange flying creature that’s been around my place. There’s only been one, and it showed up in the same area that one appeared last year. It was big (2″ or so), it hovered like a hoverfly, it had black and yellow stripes like a wasp, but it wasn’t at all aggressive. You probably know already that it was a cicada killer! It disappeared before I could get any photos, but I learned that its life span is two months, so that probably explains that. Somewhere, a buried cicada is nurturing next year’s cicada killer. Your leaf-footed bugs, bumblebees, honey bees, and flies are going to be happy as can be with your new basketflowers. I’ve seen all of those feeding on them, and often at the same time. That’s one advantage of a large bloom. There’s room for every one — and butterflies, too. I love your dragonfly, and the sweet, inquisitive look in the eye of your grackle. It’s always a pleasure to stroll through your garden, Tina. I would have had to scour the web for that too, as I’ve never actually seen a cicada killer (awesome name, though!). I have seen pictures and they’re quite something! Yes, I think you’re right that all those little pollinators will love the basket flowers–and so will the gardener. I can’t wait! Tina as always a wonderful post and full of lots of useful information. The photos are excellent and thanks to them and identified an insect that also lives in my garden: Leaf Insect. 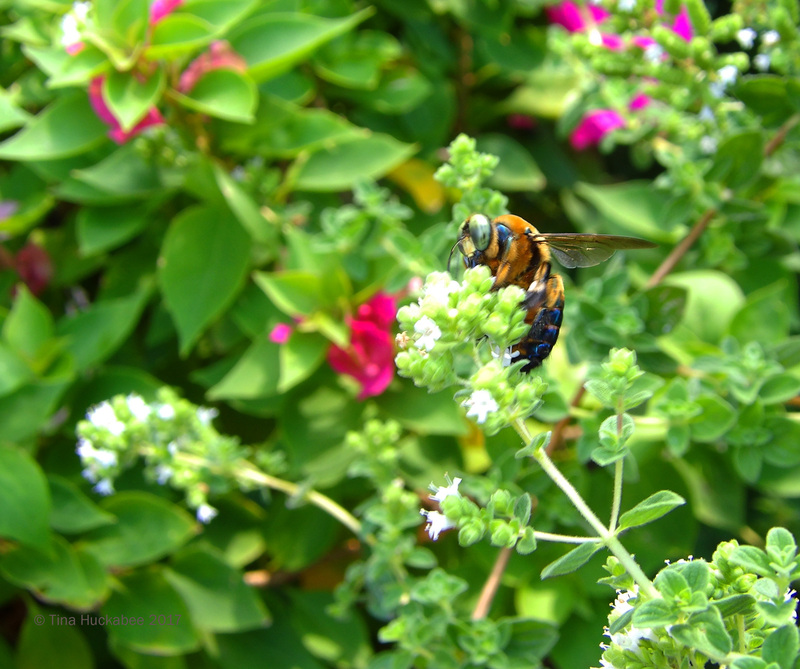 All bees are beautiful, but the sweaty Bee with its metallic green color is beautiful. Dragonflies are very beautiful. The birds are divine. 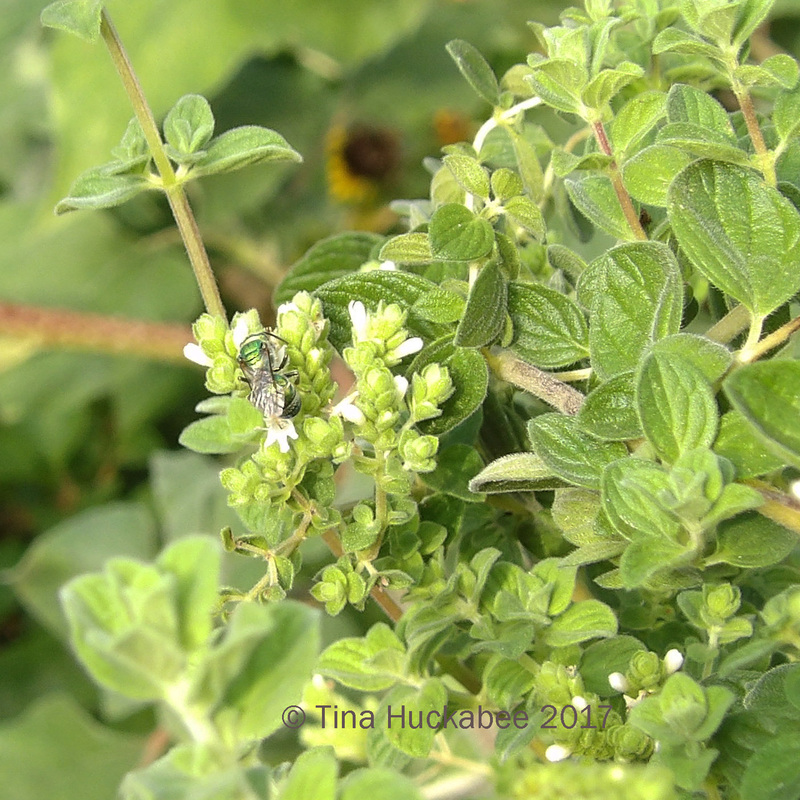 Next year I’m going to plant several oregano plants: I did not know that it was so attractive to bees. Long live the Wildlife Wednesday! Greetings from Margarita. Thanks, Margarita. 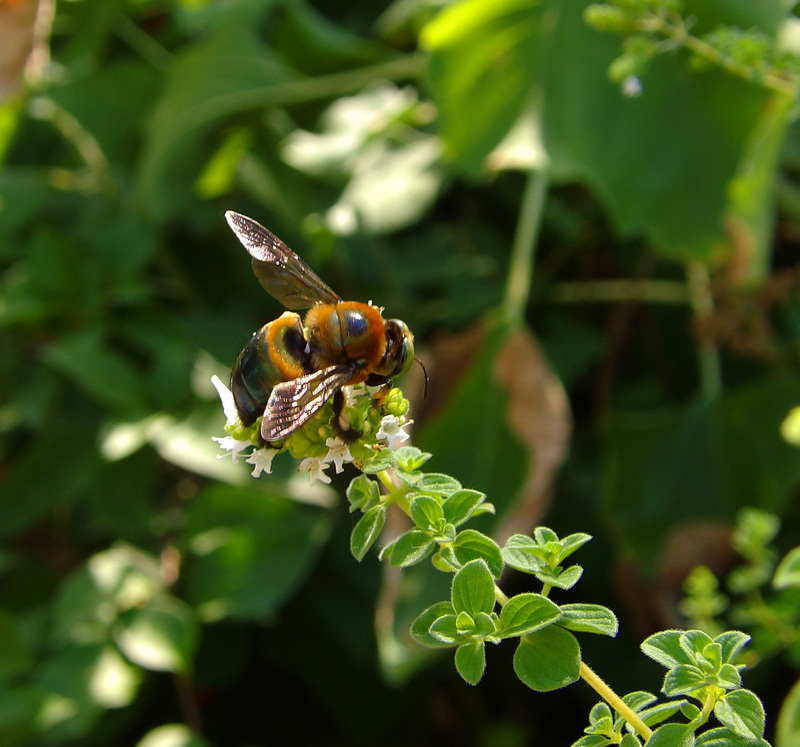 I hope you plant those oregano and any other herbs which will grow for you–they’re yummy for people and yummy for bees! Isn’t the bee gorgeous? I belive I’ve seen the specie of bee before, but am not sure. As for the two-herb solution, I just didn’t want to continue to cut back blooms for my needs while ignoring the bees’ needs. Great post and my are you lucky to have so many pollinators. I am envious of your pond/waterfall. I want one someday. The photos are wonderful. 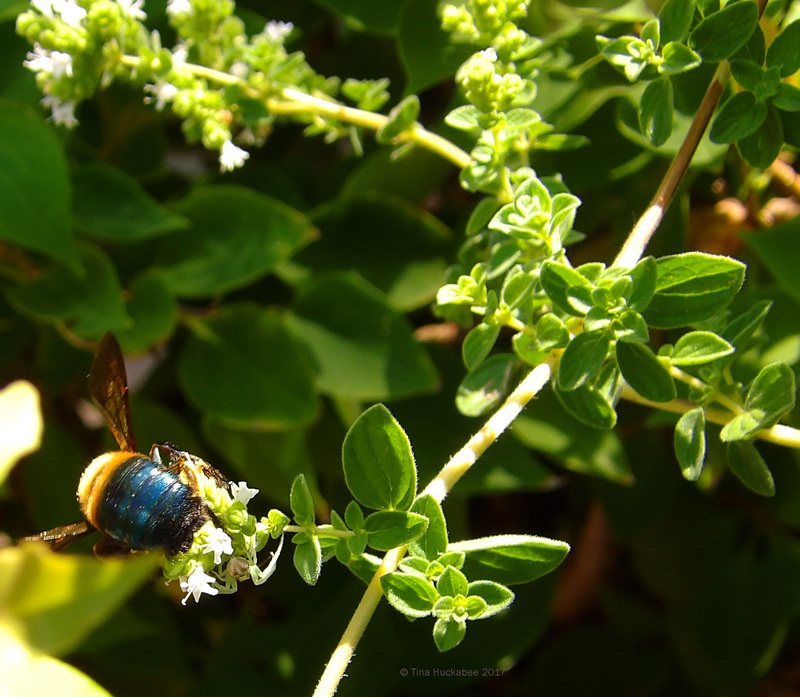 I have honey bees coming to the blue or black basil that I plant each year. I’m never sure of the true name for it since I’ve seen the basil called various names. It’s the ornamental variety. Thanks–and yes, I’m so glad for the pond. I resisted building one for years, thinking that it would be too much work. In fact, it’s a fairly low-effort item in the garden and attracts a multitude of wildlife. I’m glad you’re getting bees! That’s great, thanks for providing for them! Wonderful photos, as always. 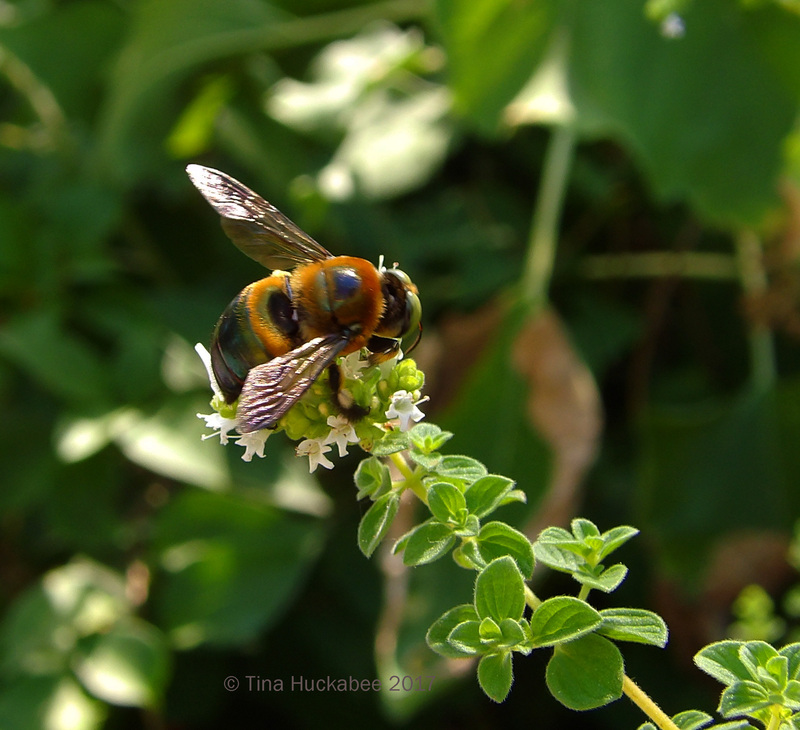 The oregano is really a magnet for all kinds of pollinators, isn’t it? We have the carpenter bees here as well, they seem especially fond of the Monardas. 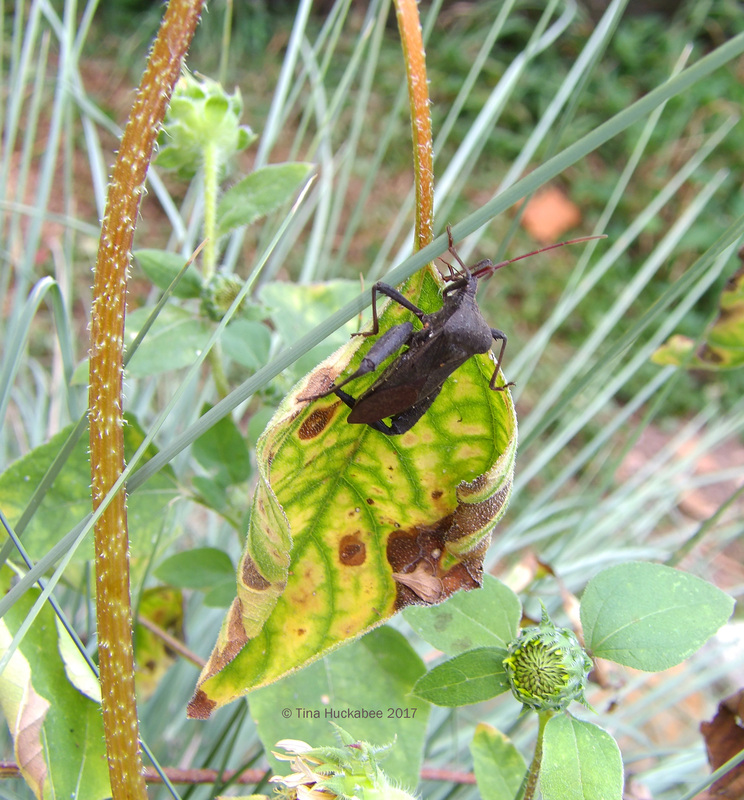 Love the pics of the leaf-footed bug. Tina, your garden looks so lush and full of life! A lot different from our semi-arid country here. My leaf cutter bees must be around, as my lilic leaves are nicely scalloped 🙂 But I haven’t seen any yet this year. They often lay eggs in crevices in the railroad ties around my beds, and I like watching them fly in with their neatly cut green circles! Btw, I put out the honeycomb and it’s being emptied of honey 🙂 I don’t see a lot of critters, but often one or two. I have lots of cutter bees, but have never seen them cutting. I see their holes with the mix of mud and leaf matter, but I’d love to see one trimming the verge.